Looking east on Third Avenue from Ferry Street on Saturday evening. 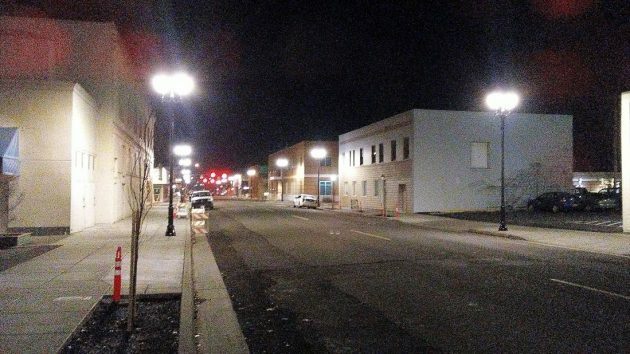 The new lights being installed downtown are certainly bright, even if they illuminate only an empty street as, in this case, three blocks of Third Avenue. Named for the shape of the fixtures, the new “double acorn” street lights are part of the $8.5 million downtown streetscape improvement project funded by CARA, the Central Albany Revitalization Area, an urban renewal district and program. The lights on Third were the first to be turned on. 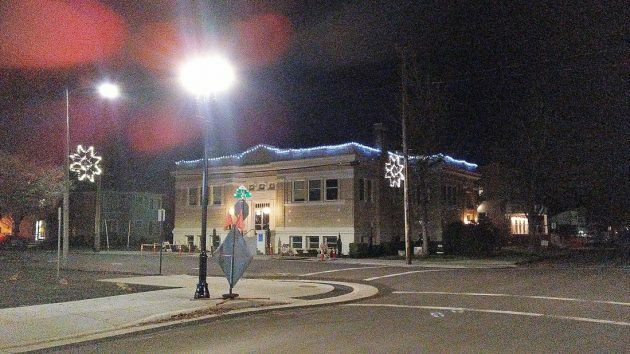 In his weekly summary of activities for the Albany council, City Manager Peter Troedsson says the lights on Third give the street a safe and welcoming feel. Lights on Second should be turned on soon, he adds. These segments of Second and Third will get another set of illumination. They will get “catenary lights,” single fixtures suspended over the middle of the street from cables strung from posts on both sides. There will be two such lights per block. When the CARA board discussed this in 2015, members decided against the catenary lights as unnecessary. But the lights were added back later as the project was expanded and refined, and the board did not object. That notice says all the remaining work should be complete by the spring of 2018, except for the final paving of the Highway 20 streets (Ellsworth and Lyon), which is planned for the summer of ’18. In the background, the Carnegie Public Library at Third Avenue and Ferry Street. No point in considering light pollution, I guess. I’m glad for the new lights! That area at night can get weird lol granted the bars aren’t what they used to be. Maybe with all that light the construction crews could work at night and finish quicker…. Adriana, those annoyingly bright lights are so we taxpayers can see the brilliance, even at night, of the lipstick the Council is spending on this downtown pig-in-a-poke! Never thought I’d have to wear dark glasses at night in downtown owing to the glare. When the “cat” lights were put back in the plan, did the CARA board enlighten us with why they thought they were now necessary? Or, did they just want to spend more money, as I have been told CARA doesn’t want to come under budget….this comes with some explanation about how they have to keep spending money to generate money in returns. What with the envisioned economic miracle growth rates of 4,5 & 6% predicted by the Trump administration, the streets of downtown Albany will be paved in gold, bathed in pools of dazzling light. Gold paved is a nice vision but well lit is a nice reality! Instead I offer you all a throated, breathy, slightly drawn out MAAAGAAAAH. They look great! A very nice improvement. Gone to my baby’s head.